Visibility Day Trans. Liq has a project with the City of João Pessoa and urrently employs ten trans people. It was a Friday morning when Alecsander left the house smiling and heart racing. The motive seems silly, but for a trans man it can mean renaissance. “I was so happy to hear that there were people to listen to me today,” he confessed. With the documents all renewed, Alecsander also renewed life. He speaks naturally about transsexuality, but he does not understand prejudice. “We are invisible to the world. I just wanted to be me, “said Ricardo Alecsander, marking Trans Visibility Day. Ricardo Alecsander is 25 years old. 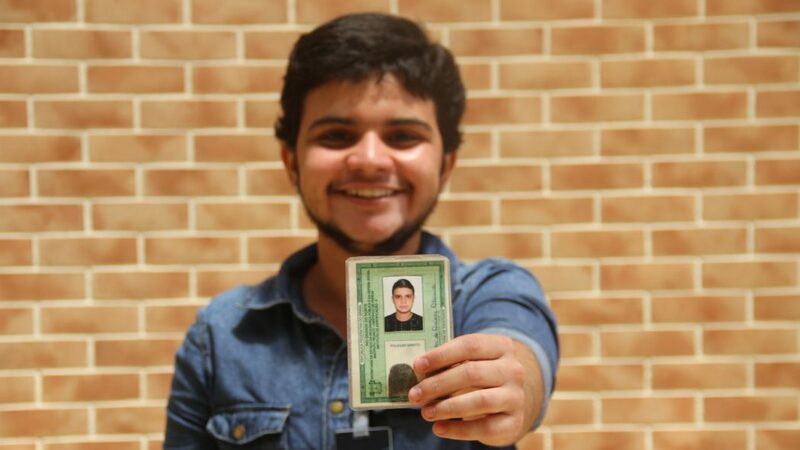 He is a native of Guarabira, but lives in João Pessoa, where he is almost finishing his psychology course at the Federal University of Paraíba (UFPB), and for a year he has achieved a place in the job market. He would have every reason to be a spiteful person if he wanted to. But she chose to smile easily. This Tuesday (29), is celebrated the Day of Visibility Trans. “Hold on, we have to be seen. This is a very important milestone, “says Alecsander. The day is celebrated in Brazil since 2004, with the aim of highlighting the importance of diversity and respect for trans people. Today, the date represents the struggle of these people to be seen, respected and heard. “Being trans, I always was, although for a long time I did not have the knowledge,” he declares. Alecsander’s own body expression demonstrates his freedom: he gestures, smiles, speaks openly, very much, as if he needs to vent for a long time. He chose to study psychology not only to understand the other, but mainly to study, to understand the world and why people can not be happy simply as they are. “The world should be for everyone,” he emphasized. He wanted to understand why people limit themselves to using a body part to identify someone. “It’s as if sexuality, identity, is a little part of my body, as if a part of my body could talk about my whole body. We’re human, that’s all who we are, who we learn to be, “Alecsander said. He was always aware that he was different, as he himself tells. What Alecsander lived as a woman, a girl, was not true. What society was trying to impose on him made no sense. But for fear of meeting this imposition and also for fear of rejection, it ended up delaying the moment of making the transition. “The world does not recognize us,” says Alecsander. And he speaks not only socially but legally and also as a citizen. For example, something very simple, like the right to use the name of trans person, is faced with a huge bureaucracy. A basic action for the human being was, for Alecsander, and still is for many transsexuals, a long way. “For a long time I’ve been trans, but I live as trans only now,” he said. But for the family, Alecsander is still a girl who dresses as a man. He lives with his mother, his sister, his nephew and an uncle. Everyone calls him by the name he had before the transition. They refer to him as “she,” always in the female pronoun. “We need to play roles that are acceptable to society. If I do not fulfill this role, I am excluded, so I am no good for society “, he emphasizes. What society welcomes as understanding is what can be seen through the body. If the expressions are delicate, the breasts are full and the hair bigger, that person is a woman. But if the images begin to confuse the labeling, what is strange becomes questioned. “Trans every day is questioned. The cis [one who assumes his birth identity] no one argues, no one questions, “said Alecsander. For a long time, Alecsander was, in fact, a lesbian girl. Without much understanding of what happened to his body, and with the changes that arose but should not be part of that body, he lived to be accepted in and out of the house. The strangeness with his own body dates from adolescence, when he needed to go to physical education class and was ashamed of himself. It was the first time she attended a psychologist and heard questions such as “are you ashamed of your thighs?” In fact, it was not exactly ashamed. Alecsander just did not know why the hormones caused a change in his body that did not fit his identity. It was when he could no longer stand in his own real life that Alecsander decided to take the first step to being who, in fact, was born to be. Two years ago he does hormone therapy. He already has a beard, his voice has already thickened a little, but the removal of the breasts has not yet succeeded. “You pretend all the time to be what people want you to be, until there comes a point you say: why do I have to be an actor and I can not be the artist?” He wondered. “It is basic for the human being to want to be loved, he needs this affective protection,” says Alecsander, a man. Alecsander was already dressed in what society means by men’s clothing. “That was always good for me,” it was natural, he explains, it was how he felt comfortable. But he began to allow himself more. The discomfort with crooked looks always existed, but he allowed himself to be himself. It started with the change in the name of the documents. “It is a very strong pain for us not to be recognized by name, it is fundamental to be recognized by the genre, to be treated as ‘him’, Alecsander, it’s me,” says the young man. Suffering begins with lack of understanding with one’s own body. But when the discovery of identity comes to light, the will to show the world who, in fact, is, is potentiated. “From the beginning we suffer from it”, so he preferred to wait, to take it, only to later live the life he was born to have. Despite some broken expectations with hormone therapy, Alecsander is happy. Look at the mirror and think “you are beautiful, you are wonderful”. “It is rewarding to look at you and say that you admire who you are, admire your courage,” he says. Having an identity or a CPF with the name you chose to have and representing your identity is not a privilege. Trans people look for the naturalness of putting stamped on the documents the name of the person who was born to transgress. And, incredible as it may seem, this is still a small problem in the face of some difficulties that Alecsander and so many transsexuals encounter. Despite having the SUS card already with his name, he suffers to receive care. With a woman’s body but male name and gender, Alecsander does not find a place that provides a transvaginal ultrasound, for example, for a man. “In SUS there is no trans category. The exam is denied. They need to put feminine, “he says. There is this struggle to exist legally, socially and even in health. No wonder, he chose names based on some meanings. Ricardo Alecsander. The first is the affirmation of masculinity, since there is no expression of the name in the feminine gender. The second, for fluidity and strength. “It carries the very meaning of guardian of humanity, I find it so beautiful. I wanted to have so much to show the world. Every human being should be loved. The human being has a lot of potential and I believe a lot in that, “he explains. Alecsander sums up his trajectory in courage. For him, only the one who has courage is the one who is afraid. It is assumed as a fearful. “Today I’m not afraid to say that I’m afraid. In my entire life, I’ve been a long time, and I still am. ” But today he does not live by fear, he lives by courage. It is out of fear that he can evolve. If there were not the fear of being who he is, he would not have the courage to face the hard barrier of being himself. Elena Valéria arrives at the company. High heels, jeans, blazer and a shoulder bag. Talk to the doorman with attention and empathy. And walk to the main ratchet. Now, sitting up, you can see the makeup on your face. The skin is very clean and in the eyes a rosy that shows vanity and, in a way, an attempt to go unnoticed. It is what she, and also Alecsander, calls trans passability. The ability to go unnoticed, if passed as cis, since it is by the body that people identify and label the genre. In this way, they avoid prejudice and devious looks. From childhood Elena felt different. He did not fit in with the boys and he did not feel very comfortable with the girls either. At home, when she was alone, she “assaulted” her mother’s wardrobe. If you rewind the old tapes from when you were a kid, you will find videos where she appears dancing songs from Xuxa, with a pink microphone. “I grew up, but first I thought I was a gay boy,” he says. At age 18, she understood that she was a trans woman. But for a long time lived denial. He tried to pretend totally that it did not exist, reproduced prejudices, and became a spiteful person. “Because of family pressures, society and fear,” he says. Then he deconstructed himself and became involved in the drag scene. She started dressing as a woman for some events and realized that this was how she felt. “I wanted more and more to be that way. I saw that I was not condemned because of it and I was able to express who I really was. It was liberating, “he says. The difficulties of childhood and the bullying she suffered at school helped Elena build the person she is today, at the age of 28. All the events that have marked his life, including his resignation for homophobia, have made the strong person who lives today without hiding. Strength is not only in life but also in name. Elena is the one who is in search of herself. “It was a great quest to find me and now I feel like I’m getting there.” Valéria is a strong and brave person. “I need strength to find me,” he explains. Although with the name already signed, signed and stamped on all the documents, already had to fight to be called as Elena. Before, when he had only the social name, he arrived at a hospital and was called loudly by his birth name. Fought. He fought for his rights. Now, at least this kind of embarrassment will no longer exist. “It’s wonderful not to have to go through those stresses anymore,” he said. Like Alecsander, Elena also talks about passability. He has not had any plastic surgery yet, but he will not miss it. Among them are genital change, liposculpture, silicone in breasts and facial feminization. The last three are the main ones, because they will allow Elena to go unnoticed with greater ease. “I’m not ashamed to be trans, but it’s dangerous to be trans”, he points out. With the family, the subject is still taboo. Treated as a man, he still tries to overcome some conflicts. Elena spent ten years to understand that she did not belong to the body that was born. There is no way she can expect her mother to accept anything in a year. When he was a gay boy, they did not touch the subject. There was no conversation. “The difference between a gay boy and a trans woman is that he can not get away from it, because the subject is going through the room,” he said. A year and three months ago, Alecsander got his first opportunity in the job market. He works as a telemarketer at the company LIQ, which has a project with the City of João Pessoa and currently employs ten trans people. Alecsander integrates the thousand employees employed by the company in João Pessoa. On the first day of work was still in the process of transition and documents still unchanged, but had the social name stamped on the badge. He went to the company for fear of not being accepted or uncomfortable in the face of the interview. But in the file already found the option to write the social name. “This is very important, it is important that companies participate in this,” he said. He walks through the corridors with the freedom he can not find in the street, even at home. She even uses the men’s room, as it has to be. It is the only place that is free to do so. If you go to a mall, avoid using the bathroom for fear of suffering violence or even hear some joke in public. Alecsander, along with Elena Valéria, are part of a partnership program between the City of João Pessoa, through the Coordination of Promotion of LGBT Citizenship and Equality, and the company where they work. In 2014, the Coordinator, Roberto Maia, was in LIQ with an alarming fact: the life expectancy of the trans people, at that time, was 35 years. Everson of Padua, the company’s HR coordinator, says that this has scared the team a lot. And after asking for help to have a facilitator in their entry into the labor market, Everson did not know how to respond. In order for the project to succeed in the company, Everson mapped out all the employees a candidate would have contact if they went to a job interview, in order to make the first preparation of these people. After that, he opened the selection process, thought of everything so that there was no embarrassment during the selection. The major concern was to give citizenship to these people within the company. “It’s no use selling the idea. I said, if we can only get here, I will not go so far, “Everson said. After implantation in João Pessoa, all other branches have the project in the whole country. Elena works in the company as a multiplier, applying training, but started as an attendant. The transition of their identity took place within the company. For the employees, the change was overnight. But for Elena it lasted ten years. “When I accepted myself and became a trans woman, my superior already informed me how I was going to change my badge,” he says. He traded his social shirts for color and high heels. The serious face was also replaced by the wide-eyed smile and the real expression of “I”. Already Alecsander just wants to be seen as in fact is, normal, with skills and abilities. “I want to be useful to society,” he said. The demand to put trans people into the labor market is, for the young, peculiar and necessary. “We really transform environments, it’s good for companies to open up. The first step is to be open to change, “he added. In addition, he highlighted an important reflection when talking about trans people in the job market: self-esteem. The self-esteem of the trans person is, of course, low, justified by non-acceptance. “The work is very related to this, it carries a lot of people, we show a lot at work. You just have to respect. It does not matter if you understand, it only treats me as I am. We just want respect, “he said. According to a survey released by the Secretary of State for Women and Human Diversity (SEMDH) from 2011 to 2018, 117 deaths of people from the LGBTQI community were registered. Between 2011 and 2017, two transvestites, 34 transsexual women and two transsexuals were murdered, counting a total of 38 people, only 12 fewer than the victims identified as gay. Regarding the location, conditions and form of the crimes, most occurred in João Pessoa, about 55% of all deaths; at night hours between 18h and 23h, approximately 38% of crimes; on weekends (35% of cases); and by means of firearms, more than half of the cases. The project Transcidadania, of the municipality of João Pessoa, was born in 2015. It gathers 10 secretariats that are part of a management committee to put the actions into practice. The center works with a multiprofessional team, with a social worker, psychologist and legal counsel, as well as housing services, employability, vocational courses, human rights and complementary health practices. According to Roberto Maia, currently 300 people are enrolled in the program. The team looks at each person’s profile and what their main need is. Through a socioeconomic survey, the trans person is inserted in the path she is needing. In order to register in the program, no documentation is required, only if you go to the Coordination Office. Documentation will be necessary, however, for forwarding to another service. The LGBT Citizenship Center operates in Parque da Lagoa, from Monday to Friday, from 8 am to 2 pm. Click here and read the whole G1 PB article.